Memphis College of Art will present The Original Art 2014-2015: Celebrating the Fine Art of Children’s Book Illustration, an annual juried exhibition from the Society of Illustrators in New York, from Feb. 16–March 16 in the Rust Hall Main Gallery, 1930 Poplar Ave., Overton Park. An opening reception will be held on Friday, Feb. 20, 6–8 p.m. 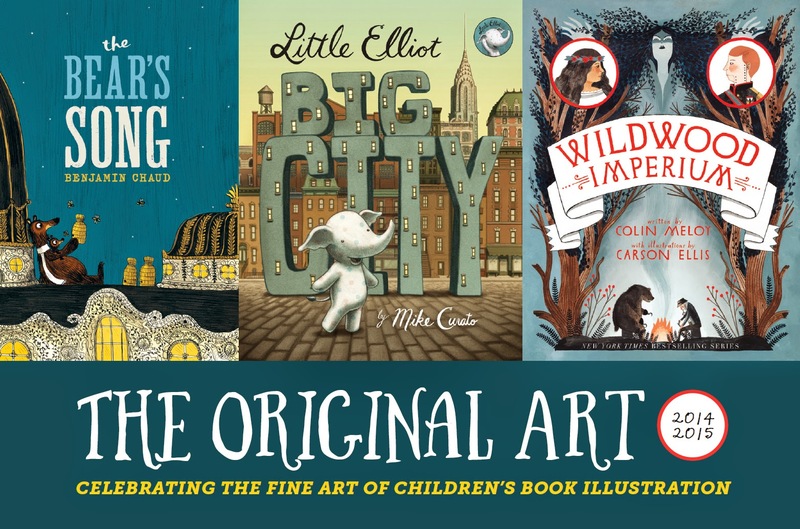 Founded in 1980 by illustrator and art director Dilys Evans, the exhibition celebrates its 32nd anniversary and showcases the original art from the year’s best children’s books. Selected by a jury of outstanding illustrators, art directors and editors, this year’s show features 40 pieces selected from the original exhibition held at the Society of Illustrators on Oct. 23–Dec. 20, 2014. Gold and silver medals, as well as a Founder’s Award recognizing the year’s most promising new talent in children’s book illustration, were awarded to Benjamin Chaud, The Bear’s Song (gold medal); Carson Ellis,Wildwood Imperium and Gary Keller, Harlem Hellfighters (silver medals); and Mike Curato, Little Elliott, Big City (Founder’s Award). During the course of the exhibition, MCA will partner with the Memphis Public Library and Artistree/Wood & Strings Theatre to create interactive events for children. “There are so many activities taking place in conjunction with this exhibition,” said MCA Professor of Illustration Michele Noiset. “We are so happy to be able to work in partnership with these wonderful organizations.” All 40 of the represented books have been donated by the Memphis Public Library to be displayed and read throughout the exhibition. The library will also partner with MCA to offer a special story reading and craft construction, which is open to the public, on Saturday, Feb. 28, 2 p.m. in the main gallery. Through a touring grant from the TN Arts Commission, Artistree/Wood & Strings Theatre’s life-sized puppets, some over 8 feet tall, will remain on site for the duration of the exhibition. Additionally, they will present a special live performance followed by a workshop in puppet construction on March 14 from 1–3:15 p.m. The performance and workshop are free and open to the public, but due to limited space, registration is required by calling 901-272-5142. Sponsors for the exhibition are the Memphis Public Library and Power & Telephone Supply Company. Gallery hours for the exhibition are Monday–Friday, 8:30 a.m.–5 p.m.; Saturday, 9 a.m.–4 p.m. and Sunday, noon – 4 p.m. All exhibitions and opening receptions are free and open to the public. For additional information, visit mca.edu.